Think the fidget spinner craze is coming to an end? Think again. In case you have been living under a rock and have not seen hundreds of children spinning something between their fingers, a fidget spinner is a small device that can spin easily, giving the user a pleasant sensory experience. The toy has been marketed as an antidote for attention deficit disorder (ADD) and other disorders such as autism and anxiety. However, due to their popularity, it seems everyone wants a fidget spinner — taking the device from the classroom to everywhere you can imagine. Astronauts have taken fidget spinners to space, yes outer space, to test Newton's Law of Motion and even acclaimed British actress Dame Judi Dench is a fan of the rotating toy. In case you are wondering how Judi came to own a fidget spinner, she revealed it was her grandson who taught her how to use it. "With all of the crappiness going in, it's strangely comforting that Dame [Judi] Dench has a fidget spinner (and isn't afraid to spin it)," one person tweeted. Another added, "Dame [Judi] Dench owns the most chic fidget spinner, naturally." Joining in on the fidget spinner craze is natural bath products maker Lush — who made a super limited-edition fidget spinner bubble bar as part of Lush Kitchen. As expected, the product was so insanely popular, they're making more. 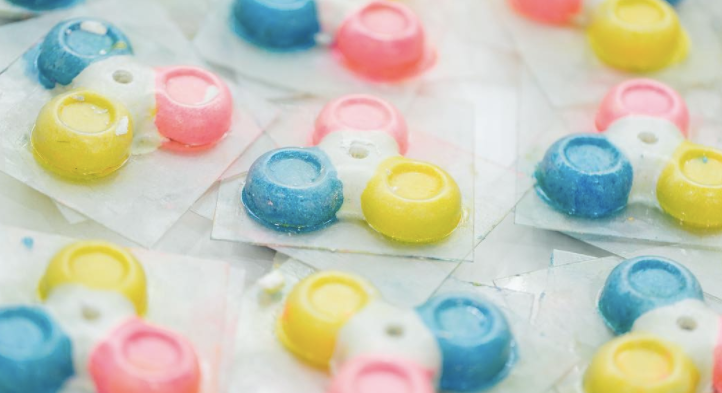 The first batch of scented spinners sold out within minutes, according to Lush. The bubble bars are reusable, and spin under running water while giving you fluffy bubbles. And tomorrow, they'll be selling more at 9 a.m. GMT (that's British time, so set your alarms). Eventually, Lush hints, these products will make their way toward British stores, and hopefully American branches, too.